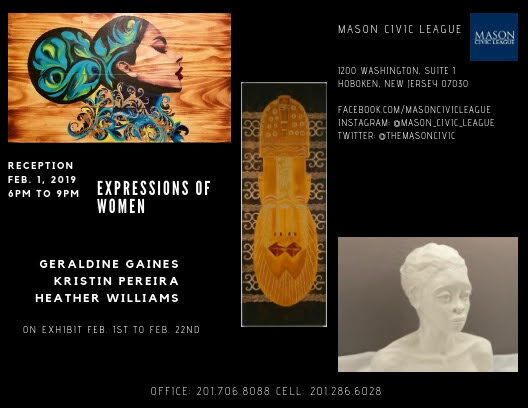 Expresssions of Women showcases local Jersey City artists Geraldine Gaines, Kristin Pereira and Heather Williams. The opening will be Friday, February 1st, from 6pm to 9pm at The Mason Civic League located at 1200 Washington Ave, Hoboken, NJ and will feature paintings, sculptures and wood carvings. Mike Womack, a previous resident DJ at LITM is the guest DJ for the evening. The gallery is open Thursdays through Sundays and by appointment. The show comes at a time when women are increasingly speaking up and speaking out. “When I was asked to curate this show, I saw it as an opportunity to give women of color a platform to express ourselves through the medium of art. Historically, female artists, especially women of color have been largely overlooked. We have a long way to go but there has been some progress. I want to continue to support that progress,” says Ms. Williams. Ms. Gaines (www.gerrigaines.com), who has performed the art of traditional African drumming and dancing, has added mask carving to her portfolio. She uses old and new wooden doors as her canvas recreating elaborate African mask images on her doors. Resulting in her series, Doors to the Past, an amazing larger than life body of work. Kristin Pereira (instagram.com/beautiful_khaos_studio) studied Graphic Design at the Art Institute of Philadelphia and obtained her undergraduate degree in Art History at Rutgers University. Bright and sometimes unusual color combinations frequently play an integral role in many of her works and bring a level of power and sensuality to the subject matter. Heather Williams (instagram.com/studio.h.arts) is a multidisciplinary artist who finds inspiration in ordinary things. Her work is abstract, reflective and sculptural in nature. She has been in many exhibitions and her work is in several private collections. She is currently pursuing a Masters in Fine Arts at The School of Visual Arts in New York. Visit The Mason Civic League on February 1st to enjoy the eclectic selection of work on display. The show runs through February 22nd.